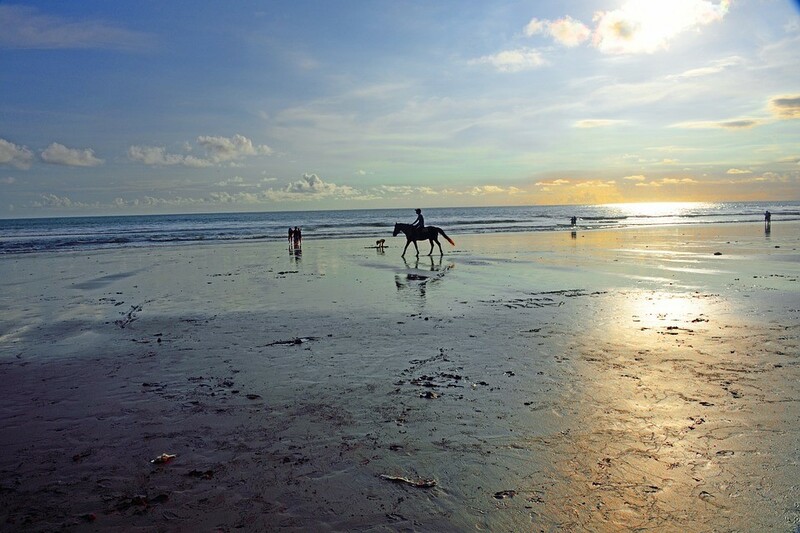 Out of all the beach areas in Bali, Jimbaran is often neglected by many. But Jimbaran is a great alternative to spots like Legian and Kuta if you want to get away from all the tourist activity and enjoy still largely untouched beaches. Jimbaran offers the perfect mix of top-notch amenities and rugged terrain, which will allow you to see a whole other side of the island you never got the chance to see before. Here’s a list of fun things to do in Jimbaran next time you’re in the area. If you think you saw it all as far as temples on the Island goes, you have to give Uluwatu Temple a try. Perched on top of a cliff overlooking the ocean, Uluwatu Temple has one of the most iconic postcard landscapes on the whole island. And if you’re looking for something even more exotic, you could check out Tanah Lot temple as well. Nestled deep into the lush coastal forest, the temple is known not only for its unique beauty but also for the beautiful wildlife that surrounds it. An absolute must-see for nature lovers looking for something out of the ordinary. Suluban is one of the island’s most unique beaches and one everyone should visit at least once in their life. The beach is surrounded by majestic limestone formations and can only be accessed by an intricate trail that goes right through the surrounding rock formations. The beach itself is fairly pristine and doesn’t attract near as many tourists as other beaches around the island. Suluban is also a prized destination for surfers and watersports lovers. However, if you want easy access to the beach, you should consider either looking at Jimbaran Bay hotels nearby. If you’re looking for more action, then you could consider hitting Padang Padang beach. Padang Padang is renowned the world over for its impressive waves, and people come from all over the world just to surf there. The barrels, in particular, are what makes the area so popular with surfers, and they’re plentiful when the weather is right. The beach is also perfect for lounging and for families as well, with tons of amenities like local stalls serving a wide array of light meals and refreshments. Speaking of meals, you cannot go to Jimbaran without having a taste of their delicious seafood. The area is filled with great cafes that serve all sorts of different seafood for an affordable price. One spot you absolutely have to try is Warung Bamboo. Warung Bamboo is one of the most popular cafes in the area and is renowned for its great food, atmosphere, and very clean surroundings. All you have to do is tell the staff which type of seafood you’d like, and they’ll cook it right on the spot, along with a wide selection of side dishes. And just like most Warungs in the area, you’ll also get the chance to taste their secret in-house sauce, which works perfectly with their wide selection of dishes. Jimbaran is a hidden gem that will be sure to amaze you if that’s your first time around. Make sure that you consider adding one or all of these activities to your list if you want to have the time of your life.